The Bears will head into Sunday’s preseason game with what looks like an open quarterback competition. Mike Glennon will start the first half against the Titans and Mitch Trubisky will get his chance with the No. 1 offense in the second half. Clearly, how the Bears’ quarterbacks play will be the focal point in the third preseason game but there are plenty of other things to keep a watchful eye on. Here are my 10 things to look out for in Sunday’s dress rehearsal. Glennon’s last chance to impress. How will the proclaimed day one starting quarterback respond with his back against the wall? This will be Glennon’s last chance to make a strong, definitive statement that he is the best option for the Bears to win this season. If Glennon has another slow start like he did in the previous two preseason games, that leaves the door wide open for Trubisky to come in and take the starting job. Elevated Competition. Trubisky has showed what he can do against second- and third-stringers but now he will play against, hopefully, the Titans No. 1 defense. How will Trubisky fare against a defense that has 10.5 sack man in outside linebacker Brian Orakpo and a revamped secondary that includes cornerbacks Logan Ryan and rookie Adoree’ Jackson? Let’s see how Trubisky does against the elevated level of competition and if he can continue his impressive start to his Bears’ career. Change can be good. Another season and another slow start for the former No. 7 overall pick in the 2015 NFL Draft, Kevin White. 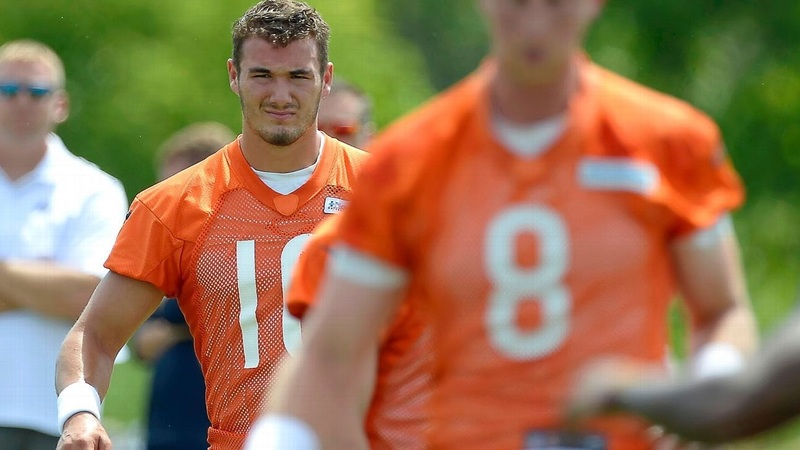 But, could that change with Trubisky in the lineup? If Glennon can’t get White going in the first half on Sunday it will be interesting to see if Trubisky is the answer to getting the receiver involved in the offense. Injuries create opportunities. After suffering an ankle injury on July 27 in a walkthrough practice, it looks like Jeremy Langford is ready to play in his first preseason game. But, how will Langford do after being out nearly a month due to injury? Luckily for Langford, he should see extensive playing time against the Titans, especially with fellow running back Ka’Deem Carey being sidelined six weeks after undergoing wrist surgery. More fullbacks. The Bears offense seems to gain positive yards when either fullback Michael Burton or Freddie Stevenson is on the field. Will that trend continue against the Titans? Make sure you monitor the yardage gained when the fullbacks are in the game. Here comes Eddie. Last Saturday, Eddie Jackson almost came down with a one-handed interception, that would have had people still talking to this very day. But the talk is still ongoing if Jackson will take Adrian Amos’s starting job. Jackson knows his responsibilities in Vic Fangio’s defense and is putting himself in position to make plays. Will this be the game where he solidifies himself as the starting free safety opposite of veteran Quintin Demps? Fighting for a roster spot. Kyle Fuller’s future with the Bears is unknown. But last week against the Cardinals he did a good job filling in for starting cornerback Prince Amukamara. Against the Titans, Fuller will most likely be playing a backup role with Amukamara now healthy. Can Fuller make enough plays in the final two preseason games to earn himself a roster spot? Making the most of his opportunities. Against the Cardinals, Roy Robertson-Harris showed how far he has come along in his young NFL career, starting off as a 265 pound outside linebacker and now being listed as a 285 pound defensive end. In the third quarter against the Cardinals, Robertson-Harris had back-to-back sacks on second and third down and forced the offense to punt. Can the young pass rusher continue to make plays to impress this Bears’ coaching staff? Carousel of returners. Through two preseason games Benny Cunningham, Deonte Thompson and Alton Howard have lined up to return kickoffs and Jackson, Daniel Braverman and Tarik Cohen have returned punts. Thompson has put himself in the lead to be the kick returner, with his 109-yard return on a missed field goal against the Cardinals. Who will be the next player to make an impact in the return game and earn themselves a starting spot? Oh, Aguayo. Roberto Aguayo didn’t have the best start to his Bears’ career, shanking a 49-yard field goal against the Cardinals. Then John Fox opened up Friday’s press conference saying Aguayo struggled in practice. Can Aguayo kick? We will find out on Sunday.